(SAVANNAH, GA) Matching proceeds raised from Kerri Goodrich’s lecture, the fourth of five lectures in the Enmark Encourage Health Educational Series 2014, Enmark Stations raised $1000 for Performance Initiatives. The nonprofit also raised funds during the Enmark Dollar Day, receiving $1 for every car wash, $1 at their charity table and $1 donations from Enmark customers. 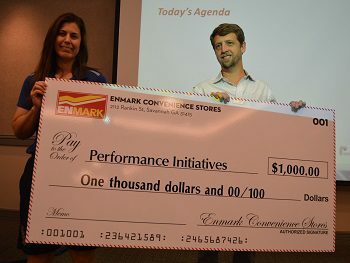 Enmark presented the check to Kerri Goodrich, the founder and Director of Performance Initiatives in Savannah at the final Enmark Encourage Health Educational Lecture on Tuesday, October 28. Enmark has partnered with Healthy Savannah, the Savannah Morning News, Savannah Magazine, WJCL and GPB Savannah – WSVH 91.1/WWIO 89.9 to present this premier series of five wellness lectures benefiting local nonprofit organizations. The Encourage Health Educational Series happens on the last Tuesday of the months of February, April, June, August and October. The series features presentations from the area’s most respected experts sharing insights on nutrition, fitness and general tips for healthy living. (LEFT) Kerri Goodrich, Founder and Director of Performance Initiatives in Savannah, accepts donation from (RIGHT) Matt Clements, Marketing Director of Enmark Stations, at the final 2014 Encourage Health Educational Series Lecture on Tuesday, Oct. 28. Founded as Interstate Stations in 1963 by Robert Demere, Enmark Stations, Inc. is a family-run business committed to offering its customers top-notch service and superior products. Today the Savannah-based company, which celebrated its 50-year anniversary in 2013, operates 64 stores in Georgia, South Carolina and North Carolina that offer high quality and competitively priced gasoline, food and beverages, cigarettes, lottery services and more. Enmark’s gasoline is filtered through a trademarked Double Filtered System, resulting in gasoline and diesel that is clean and 100-percent water-free. Enmark customers can save up to $.10 per gallon by using an Enmark Cash Card, a reloadable stored-value card that can be used directly at the pump. For more information on Enmark Stations, Inc., please call 912-236-1331 or visit www.enmarkenjoy.com . Dental hygiene is about more than just brushing daily, oral health could have long lasting repercussions on other aspects of your wellness. Open for Business® talks to Savannah’s Dr. Angela Canfield about why it’s so important to keep up with your dental care. Dr. Canfield also breaks down how she’s growing her own dental practice and expanding beyond the chair to the surrounding communities. (SAVANNAH, GA) Park Place Outreach – Youth Emergency Shelter is pleased to announce that the award-winning documentary, The Greenest Building, will be shown in Savannah at the National Preservation Conference, PastForward, on November 13, 2014. Narrated by David Ogden Stiers and produced in 2011 by Jane Turville, the film prominently features the East Henry Street facility that houses the Shelter. The film explores whether a newly constructed green building is the most sustainable choice and shows how renovation and adaptive use of existing structures can fully achieve the same environmentally friendly goals. Recognized in 2011 with a People’s Choice Bronze Telly Award and CINE Golden Eagle Award, The Greenest Building will be shown on Thursday, November 13, 2014, from 2:50-3:50 p.m. at the Savannah International Trade and Convention Center. The PastForward Film Series is open to the public and there is no admission fee. The public is also encouraged to visit the Preservation Studio, which will include live demonstrations and exhibits. The remainder of Conference events, including educational sessions, plenary talks and receptions, are open only to registered participants. The National Preservation Conference, PastForward, will be held in Savannah, Georgia, November 11-14, 2014. As the premier educational and networking event for those who are committed to saving places, PastForward pushes new frontiers in programming, outreach and engagement with robust opportunities for onsite, online and virtual experiences. The National Trust for Historic Preservation will host the event in collaboration with SCAD: The Savannah College of Art and Design and in partnership with the Historic Savannah Foundation. To learn more about the PastForward Conference please visit www.pastforward2014.com. (SAVANNAH, GA) Photos from the grand opening and ribbon cutting of the Rivers & Glen Trading Co. Friday, October 24, Drayton Street. (SAVANNAH/MIDWAY, GA) The Grass Strip Foundation, Inc, (501c3 ) a Non Profit Aviation Education and Preservation Corporation is having its 5th Annual Fly In/Open House , held at Berg Park Aerodrome (9GA2) on Saturday, November 1 from 9 a.m. to 4 p.m. Artists/Crafts folk are invited to display at no charge, but please RSVP. Show Cars and Motorcycles are invited and will have a special parking lot. Airplanes will also be on display. Come and learn more about aviation and its importance. Free parking. For detailed information call Steve Berg @ 912-884-8666. (SAVANNAH, GA) Coastal Pet Rescue today received the GuideStar Exchange Gold participation level, a leading symbol of transparency and accountability provided by GuideStar USA, Inc., the premier source of nonprofit information. This level demonstrates Coastal Pet Rescue’s deep commitment to nonprofit transparency and accountability. As a GuideStar Exchange participant, Coastal Pet Rescue uses the platform to share a wealth of up-to-date information about their work to supporters and GuideStar’s immense online audience of nonprofits, grantmakers, individual donors, and the media. (SAVANNAH, GA) Coastal Corporate Events, LLC, is pleased to announce that they are open for business. Improve your business through customer and employee appreciation events.Employee based events are customized to focus on any problem areas a business is facing: communication, morale, and team building skills. While customer based events are created based on the marketing plan of the business. Other services offered include holiday parties, meetings, launch parties, and retreats For more information, visit http://www.coastalcorporateevents.com/ or contact Marcie Moxley at 912-713-6865. (SAVANNAH, GA) Chicken Salad Chick, Savannah’s newest, fast-casual restaurant concept, is excited to announce its local fundraising partnership with the Lowcountry Down Syndrome Society. In coordination with the National Down Syndrome Awareness Month, Chicken Salad Chick will be raising awareness, and money, for the cause all month long. To participate, guests merely have to dine in at the new restaurant any Monday in October and Chicken Salad Chick will donate 10% of net proceeds to LDSS. The restaurant is at 7400 Abercorn St, Suite 512, Savannah, GA 31406. (RICHMOND HILL, GA) The Bryan County Bark Park announces its first annual Fall Festival onNovember 8th 2014 at De Vaul Henderson Park. This family friendly fun day kicks off at 10am with a 3k run and half mile walk to raise money for the Bark Park. Registration costs $25 before October 15th and $30 after this date and is available online at www.bryancountybarkpark.com or Media inquiries tolesley@francis.com or 912-429-3950. (RICHMOND HILL. GA) The Matthew Freeman Project will be hosting its fifth annual Capt. Matthew Freeman Memorial 5k and 10k on November 11, 2014 at J.F. Gregory Park in Richmond Hill, GA beginning at 8:30 am. There will be a Fun Run for children and senior citizens, inflatables for kids, and an awards presentation. Following the race events will be the Richmond Hill Veteran’s Day Ceremony at 11:00 am. The Capt. Matthew Freeman Memorial Race was started to remember hometown hero, Capt. Matthew Freeman who was killed in Afghanistan in 2009, and raise money for the non-profit project started in his name. The director of the race will be Georgia Game Changers, a store specializing in “injury-free” running and teaching others about natural running. More information on Georgia Game Changers can be found at http://www.georgiagamechangers.com/. Sponsoring the race this year is South State Bank, a bank that first opened in 1934 and recently opened a new location in Richmond Hill. Many other local businesses are also sponsoring the race. Check out www.freemanproject.org for a list of those sponsors. The Matthew Freeman Project is a not-for-profit charitable organization dedicated to the support of education in order to promote communities of promise, prosperity and peace throughout the US and the World. The Matthew Freeman Project has a scholarship for Gold Star siblings whose education was interrupted by the death of their siblings. In the past year, The Matthew Freeman Project recently launched Matthew Bears, a part of the project that makes stuffed bears for Gold Star Family members out of the uniforms of their fallen service member. All donations are tax-deductible. For more information, visit www.freemanproject.org. (SAVANNAH/RINCON, GA) Angela Canfield, DDS, announces E4D Single Visit Crowns have been introduced to her two dental offices located in Rincon and Savannah, GA. The E4D System is one of the few technologies for the creation of precise, color-matched ceramic dental restorations in one office visit. Most dental restorative methods require more than one visit to the dentist. This means that on the patient’s first visit, they get an injection of anesthesia, their tooth prepared, an impression taken and a temporary restoration put on the tooth. Making a second appointment for a couple of weeks later, the patient then gets another injection, has the temporary removed and a permanent restoration put on. With E4D technology, the procedure is done in a single appointment. This provides many advantages for patient, including: a minimally invasive procedure, fewer injections and discomfort, and biocompatible solutions while fabricating long lasting restorations in a cost effective way. More of the natural tooth is saved as well. The first step in the procedure is to prepare the tooth. Dr. Canfield removes all tooth decay and creates a divergent occlusal axial wall. Next, an impression is made using a covering of titanium dust. This dust allows the camera to take a highly detailed picture of the tooth. Images are formulated with the E4D system, which utilizes an infrared wavelength. Sometimes a tiny polyvinyl impression is taken as well. The E4D system has three major components: the acquisition device, 3D CAD software and a milling device. 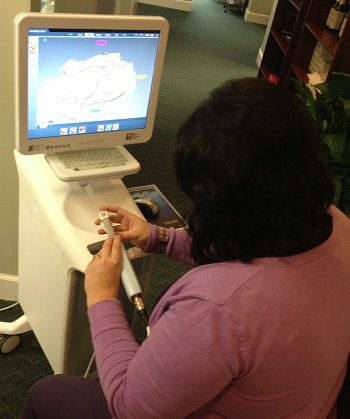 The acquisition device is a high-quality camera and a medical grade computer, which functions to photograph the prepared tooth. Three-dimensional images are created of the tooth on the screen, which Dr. Canfield uses to design the perfect ceramic restoration. The milling device manufactures the custom restoration from the specifications entered into the computer. A ceramic block, which best resembles the existing tooth color is chosen and placed into the unit. Within 15 minutes, the full crown, onlay, inlay or veneer is complete. The restoration is made of compressed porcelain, which enhances the strength and durability. Before affixing the restoration to the tooth, Dr. Canfield will stain and glaze it to become a beautiful restoration, customized to the patient’s mouth. It is then affixed to the tooth with dental cement. The quality of the results is the same as the laboratory-generated restoration, but the E4D system saves time and money for the patient. For questions or concerns about E4D technology, please contact Dr. Canfield at 912-826-4037 or molar799@yahoo.com. Dr. Canfield is licensed by the Georgia Board of Dentistry and the National Board of Dentist. She owns and practices at two dental offices: Premier Dental Designs located in Rincon, GA at 5871 HWY 21 South, and Sandfly Family Dental located in the Norwood Market in Savannah, GA. Both dental offices provide Family/Preventative Dentistry, Cosmetic Dentistry, Restorative Dentistry, Orthodontic Dentistry, Digital X-Rays, E4D One Day Crowns, Electronic Claims, Intra Oral Camera and Paperless Charting. The offices are open Monday through Thursday and offer evening appointments. For more information, call 912.826.4037 or visit http://www.premierdentaldesigns.com/ or http://www.sandflyfamilydental.com/ . (SAVANNAH, GA) The Coastal Empire Polio Survivors Association will meet Saturday, October 25 at 10:30 a.m. in the Lewis Cancer Pavilion on the Candler Hospital campus, 225 Candler Drive, in Savannah. Kathleen Waters, MCD, CCC-SLP, Speech-Language Pathologist at Memorial University Medical Center, will discuss swallowing disorders and vocal weakness in polio survivors. Polio survivors and guests are invited. There is no charge for this meeting. For information call 912-927-8332 or go to www.coastalempirepoliosurvivors.org. (SAVANNAH, GA) Coastal Corporate Events, LLC, is pleased to announce that they are open for business. Improve your business through customer and employee appreciation events. Employee based events are customized to focus on any problem areas a business is facing: communication, morale, and team building skills. While customer based events are created based on the marketing plan of the business. Other services offered include holiday parties, meetings, launch parties, and retreats For more information, visit http://www.coastalcorporateevents.com/ or contact Marcie Moxley at 912-713-6865. (SAVANNAH, GA) Internationally acclaimed jewelry craftsman Gregory Crawford is bringing his unique jewelry designs to Savannah for a rare public showing at A & C Gold and Diamonds on October 24 and 25. The craftsman also will be available for limited private consultations by appointment only. For more information, call Craig Burgess at 912.224.3247 or visit www.acgoldandsilver.com. (RICHMOND HILL, GA) The Bryan County Bark Park announces its first annual Fall Festival on November 8th 2014 at De Vaul Henderson Park. This family friendly fun day kicks off at 10am with a 3k run and half mile walk to raise money for the Bark Park. Registration costs $25 before October 15th and $30 after this date and is available online at www.bryancountybarkpark.com or Media inquiries to lesley@francis.com or 912-429-3950. (SAVANNAH, GA) Savannah Morning News presents the first annual Savannah Amateur Table Tennis Tournament, “Get It On Like Ping Pong” will be played on October 25 at the Armstrong Center, 10056 Abercorn Street. The net proceeds from the event will benefit Union Mission and The Empty Stocking Fund. Players and guests, including some of Savannah business and community leaders, will be treated to an exciting round robin format of tournament play with many of them in costume. To register as a player or to purchase tickets, go to www.savannahnow.com/tabletennistourney. (SAVANNAH, GA) The Savannah based service station and convenience store chain, Enmark Stations, Inc. announces the opening of five new locations in South Carolina. All five stores will serve breakfast, fried chicken and other prepared food items. The new convenience store locations include: 125 Mathews Drive in Hilton Head Island, SC; 3860 Highway 378 Leesville, SC; 1318 Edgefield Highway in Aiken, SC; 2461 Charleston Highway in Aiken, SC; and 113 Main Street in Wagener, SC. For more information, visit www.enmarkenjoy.com. (SAVANNAH, GA) Internationally acclaimed jewelry craftsman Gregory Crawford is bringing his unique jewelry creations to Savannah for a rare public showing. Craig Burgess of A & C Gold and Diamonds has invited the master designer to display his collections at the store’s Savannah location on October 24 and 25. The craftsman also will be available for limited private consultations by appointment only. Crawford holds a U.S. Patent for the Holo-Gem pendant and one of his rare Holo-Gem fire opal pendants is now part of the Smithsonian’s National Gem Collection. He began his life’s work in 1972 at the age of 20 in Macon, GA. It was there where he and Burgess first met when Burgess was a teenager. Crawford has devoted the last quarter century to designing and building intricate settings for superior gemstones. Using only simple tools and traditional methods of hand carving, finishing and setting, Crawford is especially fine-tuned to the fact that there are usually powerful and meaningful life events which spark a fine jewelry commission. Crawford’s showing in Savannah will coincide with Burgess’ celebration of his 35th anniversary as the local authority on rare and beautiful objects and his return to the business after a medical sabbatical, as well as the one-year anniversary of the re-opening of his company, A & C Gold and Diamonds. In conjunction with the celebration, Burgess is also inviting the public to receive a free examination and digital photograph of a gem using A&C Gold and Diamonds’ state-of-the-art high definition photography equipment throughout the month of October. The camera system produces a detailed image of the gem that can be used for insurance identification purposes, or to complement an appraisal. For more information, and to schedule a personal one-on-one appointment with master craftsman Gregory Crawford, contact Craig Burgess, founder, A & C Gold and Diamonds at 912.224.3247 or www.acgoldandsilver.com. A&C Gold and Diamonds is a buyer and seller of fine items and collectables, primarily precious metals and gems such as diamonds, gold, silver, platinum, estate jewelry, heirlooms, coins, rare currency and more. Owned and operated by Craig Burgess, with locations in Savannah, GA and Bluffton, SC, A&C Gold and Diamonds combines 35 years of knowledge and an expansive network of industry contacts and connections that are unsurpassed in the region. For more information, call Craig Burgess at 912.224.3247 or visit www.acgoldandsilver.com. Park Place Outreach Youth Emergency Shelter, Inc. is the only facility in Savannah and Chatham County that serves youth age 11 to 17, who are going through a stressful period at home or who are victims of physical and/or mental abuse. As part of its progressive program offering, PPO will partner with the famous Olde Pink House restaurant in Savannah to offer monthly cooking classes to kids, conducted by one of Pink House’s expert chefs. On the second Saturday of each month, a chef from the Pink House will conduct a cooking class from 1-4 p.m. That evening, the class will enjoy the meal they have learned to prepare by dining at the Pink House. Classes began October 11 and the menu will change according to the season. The next scheduled class is Saturday, November 8. (SAVANNAH, GA) Rivers & Glen Trading Co. announces the grand opening ceremony on Friday, October 24, of their second location at 24 Drayton St. in Savannah, Ga. The ribbon cutting ceremony will take place in front of the new store at 5:15 p.m. in true Rivers & Glen style with the ribbon being made out of fly fishing line. Hors d’oeuvres will follow, catered by The Olde Pink House. Ben Austin, a representative of the Orvis Corporation, will host a fly fishing casting demonstration at noon in conjunction with the grand opening celebrations planned. In August 2010, Hopkins bought Rivers & Glen Trading Co. from Vince and Gayle Ardrey. Before owning the Augusta store, Hopkins was an avid shopper at Rivers & Glen and worked there. Previously, Hopkins had worked as a real estate agent. One of Hopkins goals for his leadership at Rivers & Glen was to revive the art of fly fishing in Georgia. Sportsmen can fly fish in the Savannah River, Saluda River and private ponds. The Rivers & Glen store in Savannah will be offering different fly fishing lessons, tying workshops and other educational opportunities on proper techniques. Hopkins grew up in Thomson, Ga. He was the oldest of his brothers and raised by his stay-at-home mom, Liz, and his stepfather, Bill, who was a cattle farmer. His father, Vic Grout, was a banker. Hopkins studied at University of Georgia and Augusta State University. In high school and college, Hopkins worked at his stepfather’s farm, feeding cattle and growing wheat and hay crops. “Growing up in a small town and working on the farm, it became natural for me to be in the woods and outdoors all the time. It makes sense that I would wind up owning a store that offers outdoor clothing, fly fishing gear and sporting supplies to explore with,” Hopkins said. Hopkins lives in Thomson, GA with his wife, Melissa Hodges Hopkins, daughter, Mary Lyles Hopkins and son Boone Hodges Grout Hopkins. When he isn’t managing his two stores, Hopkins enjoys golf, fishing, hunting and other outdoor activities. During the opening of his second location, Hopkins plans on giving away prizes such as a leather and canvas Filson Bag. For more information about the grand opening celebration and the Savannah branch of Rivers & Glen, call 912.349.2352 or visit riversandglen.com . Rivers & Glen Trading Co. is a sporting retailer based in Augusta, which has now expanded into Savannah, Ga. The locally owned and operated stores carry popular brands of apparel, luggage, fly fishing and hunting equipment including Orvis, Patagonia, Filson, Barbour, Simms, Mountain Khaki and Fishpond. Striving to be the region’s fly fisherman’s dream store, Rivers & Glen stores carry every Orvis and Sage rod available on the market. Both locations are open Monday through Saturday. The Savannah store is located at 24 Drayton St. The original Rivers & Glen Trading Co. store is located in the middle level of Surrey Center in Augusta Ga. For more information, call 706-738-4536 or visit http://riversandglen.com/ .